Jamie 4 President is another project from Wild Animals singer/guitarist Jamie Ruiz Green. I really think Wild Animals are a fantastic band, so I was excited to listen to this album. While you will absolutely hear similarities to his other band (it is the same singer after all), Jamie 4 President explores new sounds that really differentiate it from Wild Animals records. What I hear most from Jamie 4 President is a similarity to the sort of lower-fi US indie rock of the mid 90s. Maybe a little bit like poppier Guided By Voices (though not quite that lo-fi) or perhaps owing some inspiration to the more upbeat moments of the Polyvinyl catalog. I tend to enjoy the louder songs the best like "Everything Fades" and "Power Ballad Prince," but every song on this album is worth checking out. I'd also be remiss not to point out "Far From Blue," with it's "Lucky Denver Mint" style drumming and big, catchy chorus. 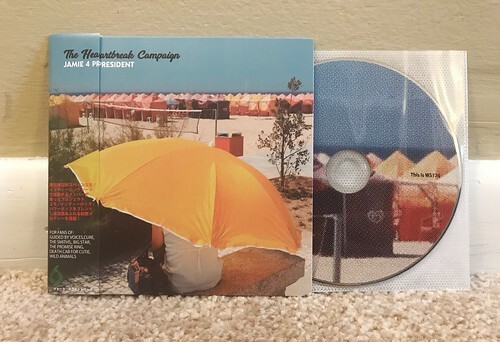 The Heartbreak Campaign is a great listen. Whether you're already familiar with Wild Animals or not, it's worth checking out. And if you haven't heard Wild Animals, you should correct that oversight right away.